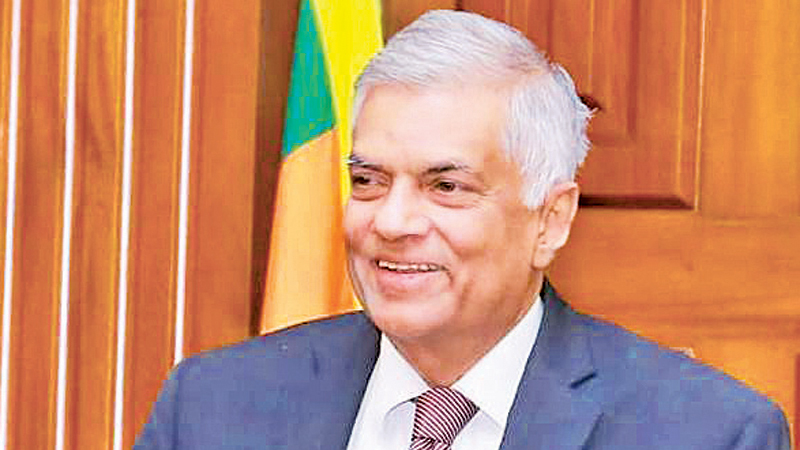 Prime Minister Ranil Wickremesinghe yesterday denied allegations that the UNP has introduced a new Constitution that is unfavourable to the country. The Premier also assured that there is no draft of a new Constitution available as alleged. Prime Minister Wickremesinghe pointed out that it was former President Mahinda Rajapaksa who agreed with the devolution of power to the regions in 1995. The UNP has never endorsed such power devolution and has insisted on power devolution within a unitary state, Wickremesinghe also said. Premier Wickremesinghe was speaking while participating in the opening ceremony of a Dhamma School building, residence for Maha Sangha and an almsgiving hall at Karagoda Sri Poorwarama Purana Viharaya, Yakkalamulla. Prime Minister Wickremesinghe said that the devolution of power according to regions does not suggest that the country is being separated. When Mahinda Rajapaksa was the President, he promoted power devolution. Then, why does he (Rajapaksa) call it a separatist movement when we speak about power devolution,” Prime Minister Wickremesinghe questioned. “Our senior political leadership such as D.S.Senanayake, J.R.Jayewardene and R.Premadasa had always held the opinion that Sri Lanka should not be divided, and it is the same opinion that I hold,” Prime Minister Wickremesinghe pointed out. The Prime Minister also pointed out the importance of having a dialogue to seek the opinions of the Chief Prelates of the Malwatte and Asgiriya Chapters on the proposed Constitution as their opinions are decisive for its success. “The Malwathu Maha Nayaka Thera recently made a comment of the proposed new Constitution. We should do an in depth study in to this opinion. Some people are going around alleging that a Constitution has been introduced which could separating the country,” the Premier said. Prime Minister Wickremesinghe also pointed out that all the reports prepared by the Constitutional Assembly and the speeches of its members are freely accessible on the Parliament website. He requested any concerned citizen to refer to those documents before coming to any conclusion. “We are not even sure if we would get a two thirds majority to pass the new Constitution. It is up to the party leaders to take that decision. If a two thirds are agiant a new Constitution, it won’t happen. Therefore, there is no need to make a serious issue out of this,” the Prime Minister further said. Premier Wickremesinghe also said that he will soon introduce a special programme to develop temples in parallel to other development projects across the country.